Even as Guyana’s top advisors and legal team on Sunday already “mapped out the broad options” to take the border controversy with Venezuela to the International Court of Justice (ICJ), Foreign Affairs Minister Carl Greenidge insisted that that Spanish-speaking nation would have to respect the decision by that United Nations (UN) judicial body. Although Venezuela is an original signatory to the ICJ, that country has not made declarations recognizing it as having compulsory jurisdiction. The rules also provide for Venezuela to accept the court in its original jurisdiction to settle a particular dispute and accept the decision as binding. In its advisory capacity, the UN Secretary General can ask the ICJ for an advisory opinion that will not be binding but carry great legal weight, moral authority and regarded as an instrument of preventive diplomacy and peace-keeping. In that regard, the Guyanese Foreign Minister was confident that the ICJ would find that the 1899 Arbitral Tribunal Award remains a full, final and perfect settlement of the land boundary between Guyana and Venezuela. “An advisory opinion will say this Treaty is still in existence; nothing has come to displace it. That is fine,” he said. After having accepted the boundary line and was involved in its demarcation, Venezuela in 1962 revived the claim on the basis of a letter by a junior lawyer to the tribunal that had theorised collusion between the Russian and American members of the Tribunal. 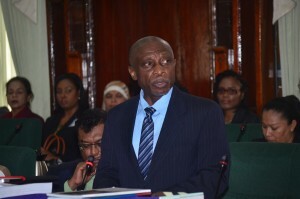 Even if Venezuela maintains that the Essequibo Region is hers after the ICJ’s ruling, the Foreign Minister said the Court’s decision would be quite comforting to investors, among others, because the western neighbour is obliged to respect international and international treaties such as the 1899 Arbitral Tribunal Award. “It is very comforting because it is not for a country to decide unilaterally what are its obligations and the world’s obligations. You are in a community. You are not an island as a country. You can say whatever you like but you cannot pronounce on the law which is an international one; in other words the law that we are making reference to is internationally fashioned; it is not a Venezuelan law or a Guyanese law. It’s an international treaty and you are obliged under the UN framework itself to honour treaty obligations and to honour the international law so once there is a pronouncement as to the standing of a treaty and, this in particular, we are fine. That is very comforting,” he said. The Foreign Ministry’s advisors and lawyers met all day Sunday and identified issues that require immediate attention and others on which Cabinet has to provide policy guidance. A report emerging out of that meeting is this week expected to be presented to Cabinet for decisions to be made on the legal team, timing, and how to approach the ICJ after further consultation with the UN Secretary General. He said Guyana would consider the UN Secretary General’s offer to establish a Good Offices process, alongside the ICJ hearing, as distinct from the Good Officer’s process that had been ongoing for the past 51 years without any progress. The APNU+AFC coalition-led administration has supported a decision taken by the last People’s Progressive Party Civic-led administration that the controversy over the 1899 Arbitral Tribunal Award should be settled at the ICJ.